Ozzy Blackbeard: Look what I got!! I got it on Friday from the Singer Sewing Centre in Belfast. You may recall a few weeks ago I said my sewing machine had thrown a wobbly. I really wasn't sure if I'd be able to get it fixed because it's so old. Well, the stars came into alignment re the funding for a new one. It took me a few days to actually realise this, and an awful lot of, "are you mad, get a new sewing machine! ", from Mr BB and my Dad. Cue lots of internet research, and I came up with this. The people in the shop were fantastic. They sat me down and showed me all the features, I was sewing through nine (yes, nine) layers of denim one second, and one layer of chiffon the next, and the machine didn't try to eat the fabric! I was in the shop for about an hour. and they told me if I have any problems with it, or am not sure about anything on it, just to call in. For local readers, they also sell lots of sewing notions, It's So Easy sewing patterns, and yarn. The yarn was mostly Stylecraft and Robin. There was some gorgeous purple Stylecraft DK, but I was strong. Stitches 1-4 are straight stitches, 3 and 4 have a long and a short backstitch. 5 is a triple stitch which can be used for top-stitching, or as a reinforcing stitch. 6 is a stretchy stitch for sewing on the bias - there's an example further down. The symbol below 21-23 is for the speed control, which is the white slider at the bottom. "Slow" is the tortoise (which it's at in this photo), slide it along, and "fast" is the hare. The screen shows which stitch has been selected, and the buttons change the stitch width and length, and select the most commonly used stitches. The bobbin sits in front of the foot, and the bobbin cover is clear so you can see how much thread you have left - genius. This handy gadget cuts the threads. To change the foot, you push this black thingy towards the needle, and the foot just falls off! To put on a foot, you set it beneath the foot arm, lower the foot lever, and it snaps into place. Not a pair of pliers in sight! This threads the needle - amazing! Aren't they fantastic? These were my first go. The numbers at the top are the stitch numbers. The horizontal one at the bottom is 16 done twice, which makes a more sturdy buttonhole. All you do is do a 16 buttonhole, and when the machine beeps, take your foot off the foot pedal, then put it back on again. The machine sews another buttonhole over the top. All I had to do was cut the buttonholes open. After my lame attempts at buttonholes on my old machine, this is nothing short of witchcraft, and I love it! And here are the other stitches. Again, the numbers are the stitch numbers. Finally, this is stitch 6, the stitch for sewing on the bias. I've never seen this before, and I don't know if it is stretchier than a straight stitch (which is below). But then I only sewed less than 3 inches of both, so it's a bit hard to tell. If anybody has any experience of this stitch I'd like to know what you think of it. I have been sewing with it, but more of that another time. If you haven't died of boredom yet, thank you for humouring me! I'm just so excited about it! Spare a thought for my friend in work who had to listen to me all day on Monday. I did text her at the weekend to tip her off though. And thank you for all your lovely comments about my scarf, I've been enjoying wearing it this week, and I definitely recommend blocking wires. I won't be posting at the weekend because I'm going to visit my friend in England, where I hope to make some woolly purchases - naturally I will show you them when I get back. Wooo - how exciting!!!! 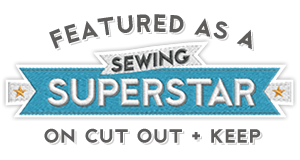 What a fab new sewing machine you have!!! 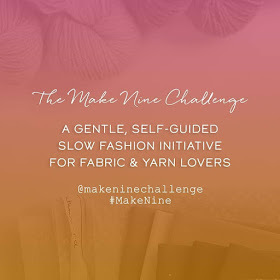 You will be whipping up gorgeous sewn things like there's no tomorrow - I can't wait! And NINE layers of denim...that's impressive! Wow! That is some serious machine! I hope you have lots of fun with it!